Who could not resist this adorable floppy-eared bunny. 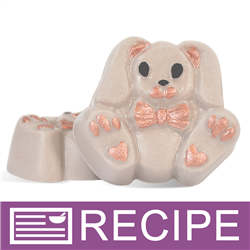 Fragranced with White Truffle Raspberry, this is sure to be a hit at your spring craft show or will make great favors for your Easter dinner! To a plastic beaker, add 0.20 oz. fragrance and 0.10 oz. stabilizer. Mix and let sit for 2 minutes. To a microwave-safe measuring cup, add 9 oz. of cut up white soap. Heat in microwave until melted. Add 0.15 oz. brown color bar cut into small pieces. Stir into melted soap until the color has completely blended in. If necessary, reheat soap briefly to melt color bar. Mix in fragrance mixture and stir well. 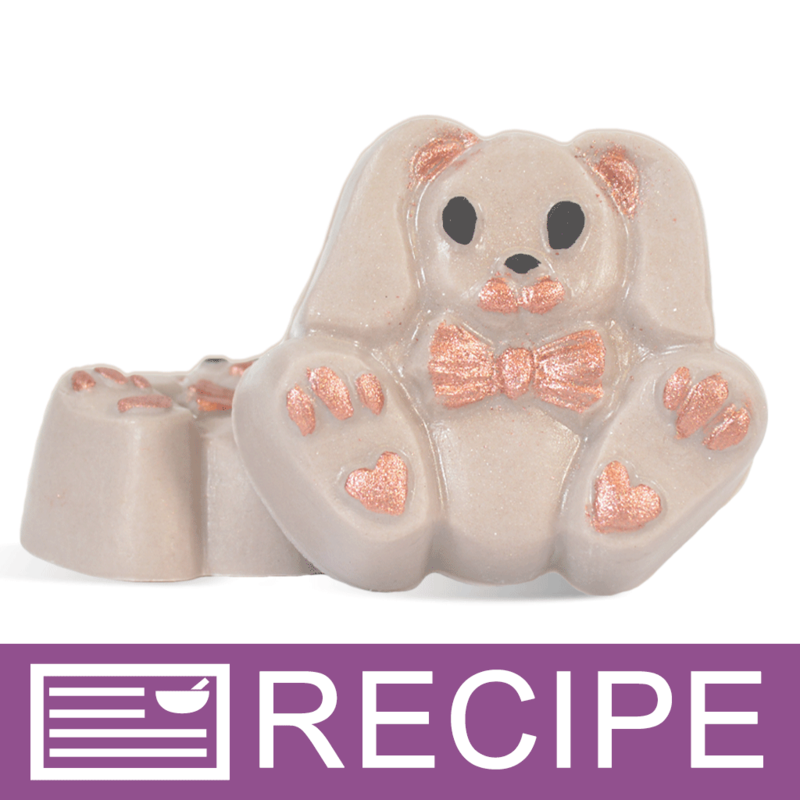 Pour soap into all three soap cavities. Spritz with alcohol and let harden. Unmold soaps and set aside. Repeat above steps to make six additional bars, if desired. Lay soaps out on covered counter or tabletop. To a small container, add 1/8 tsp. French Silk mica powder. Mix with very small amount of rubbing alcohol until powder is wet. If too much alcohol is added, mica paint will be too thin and watery. Add more mica powder if this happens. Using a very thin child's paintbrush, carefully paint on the bunny feet, bowtie, mouth area, and ears. Once mica has dried, more color can be painted on for a darker shade. To a second small container, add 1/8 tsp. black pigment powder mixed with a small amount of rubbing alcohol. Be very careful with this powder. It gets airborne quickly and can appear on the soap where it shouldn't be. We recommend wearing gloves and frequently washing your hands to remove any black pigment powder. Using another paintbrush, carefully paint on the eyes and nose. Let all soaps dry overnight. A small amount of mica powder may rub off if touched. If desired, spray soaps with a small amount of aerosol hairspray to set color in place. Package one soap in cello bag with a small amount of crinkle paper on the bottom. Tie bags with curling ribbon. Ingredient Label: Sorbitol, Propylene Glycol, Sodium Laureth Sulfate, Stearic Acid, Myristic Acid, Water, Sodium Hydroxide, Sodium Cocoyl Isethionate, Titanium Dioxide, Fragrance, Iron Oxides, Mica.